This is an image of Ardi Rizal, aged 2, who smokes two packs of cigarettes a day. 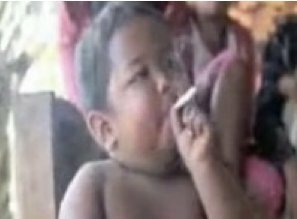 The Sumatran toddler was first given a cigarette when he was just 18 months old. I came across the report on this poor boy on the Facebook page of Dr Mehmet Oz, the doctor on the Oprah show. EMBED-Ardi Rizal - The real SMOKING BABY !! This is 2-year-old Ardi Rizal and he smokes up to 40 ciggies a day thanks to his dad who gave him his first taste of nicotine at 14-months-old. Ardi's mother says that her son's habit costs the family around $5.50 a day and he only smokes one brand. Ardi's mother cried as she said, "He's totally addicted. If he doesn't get cigarettes, he gets angry and screams and batters his head against the wall. He tells me he feels dizzy and sick." Can you imagine him reaching for a pack of cigs after drinking from his mom's teet or asking her for a light while she changes his diaper? The government has agreed to give Ardi's family a new car if he quits. But Ardi's father, who is about to be named Person of the Century by the tobacco companies, doesn't know what the big deal is, "He looks pretty healthy to me. I don't see the problem." Just so you know, Ardi's father is legally blind and has no nostrils.